The transition to a circular economy will do more than save the planet - it will also create vast new economic opportunities. Some trends are clear. There will be more people in the world, we will be a more urbanised society over time, urban societies will consume more resources per capita, many resources will be scarce and the environmental cost of creating virgin resources will soon be too much for the planet to bear. This is why a circular economy is such an appealing concept. It is a new way of life that can help the world adapt to these trends in a climate-friendly way. It is a criminal waste of energy, effort and cost to use fresh potable water for construction, watering landscaped areas or even for flushing the toilet. Using recycled greywater (from our showers and sinks, for example) or blackwater (the water flushed from our toilets) for these applications would reduce the need for freshwater, eliminate water scarcity and ensure that our bodies of water do not continue to be dumping grounds for solid waste, treated or otherwise. The nutrient-rich fertiliser obtained in the wastewater treatment process can be used for agriculture and is a welcome byproduct. Back of the envelope calculations indicate that India could save more than $1.4 billion in foreign exchange and subsidies each year only from the fertiliser obtained and also meet more than 10% of its water requirements through recycling. Who would have thought there would be gold in solid waste and wastewater? The good news is that the amount of municipal solid waste (MSW), one of the most plentiful by-products of an urban lifestyle and now a newly discovered treasure trove, is growing even faster than the rate of urbanization. A World Bank report in 2012 stated that 10 years ago there were 2.9 billion urban residents who generated about 0.64 kg of MSW per person per day (0.68 billion tonnes per year) which has increased to about 3 billion residents generating 1.2 kg per person per day (1.3 billion tonnes per year). By 2025 this report estimates that figure will likely increase to 4.3 billion urban residents, each of whom will generate about 1.42 kg per day of municipal solid waste (2.2 billion tonnes per year). Going by this report there will be an increasing supply of gold ore in unlikely places - which can be used in the circular economy. The impact of a circular economy could be massive. A 2016 report by Ellen MacArthur Foundation and the United Nations Conference for Trade and Development (UNCTAD) says that India could create as much as $218 billion in additional economic value by 2030, rising to $624 billion by 2050, by adopting circular principles across only three areas: cities and construction, food and agriculture, and mobility and vehicle manufacturing. The same report adds that circularity could cause a 23% reduction in greenhouse gas emissions by 2030 rising to 44% by 2050, and a 24% reduction in the use of virgin materials in the same period (38% by 2050). A report by the same authors on China stated that applying circular economy principles at scale in China’s cities could make goods and services more affordable for citizens, make cities more liveable, reduce emissions of fine particulate matter by 50%, emissions of greenhouse gases by 23%, and traffic congestion by 47% - all by 2040. Even heavily energy-intensive sectors such as aluminium and steel could benefit immensely from circular economy principles. Reports indicate that per-unit emissions from the manufacture of these metals would go down by more than one-third if recycling were to become an important part of the way in which these metals were made available for use. 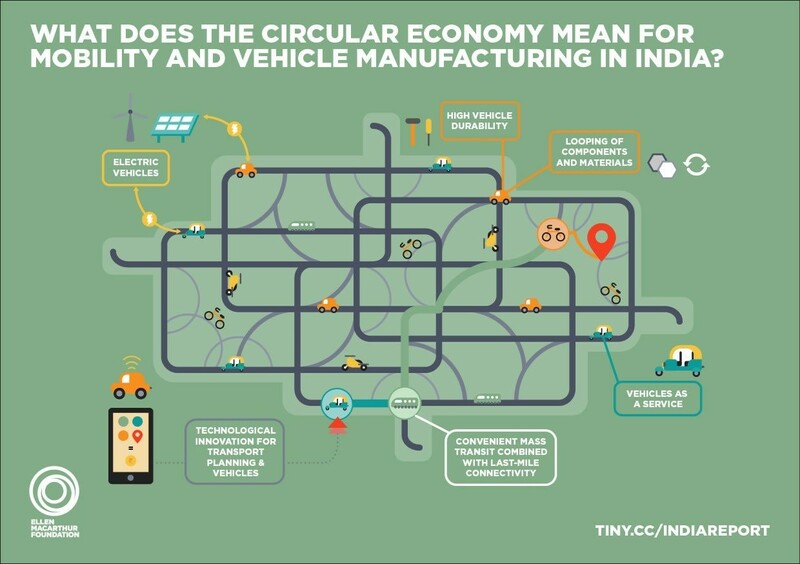 Several building blocks of circularity are deeply ingrained in Indian and Chinese habits, as exemplified by the high rates of repair of vehicles and the distributed recovery and recycling of materials post-use. Often handled informally, these activities provide the only source of livelihoods to some of the world’s poorest populations. By turning these existing trends into core development strategies, these countries could generate significant economic savings and massively cut down on carbon emissions. While developing countries must learn to do more and do it better, developed economies have an opportunity to re-orient the “take-make-dispose” economic model towards a more circular paradigm. Can China and the EU lead the global shift towards a circular economy? China has taken some important steps already, such as passing a Circular Economy Promotion Law in 2009. The Law was formulated for the purpose of facilitating a circular economy, raising resource utilisation rates, protecting and improving the environment and promoting sustainable development. This was after a strong run between 1980 and 2010 when China’s economy grew 18-fold, but its energy consumption grew only five-fold. According to World Bank data, that reflects a 70% decline in energy intensity per unit of GDP. Despite the progress made by China, it still has some way to go to reach the energy intensity of the European and Indian economies. Intensification of circularity in the economy can be a good way to start this process. Climate change has presented us with the biggest opportunity to reboot the world economy. Along with energy efficiency and renewable energy, enhancing circularity of the economy can help us pursue a low-carbon growth path. Each of the impact areas presents business opportunities that can keep the economic engine purring as we unearth gold from unlikely places.